Imagine an underwater fairyland, studded by “castles” of multi-hued coral as far as you can see. Amid the yellows and oranges and greens and blues swim an equally astonishing array of marine wildlife: barracuda, parrotfish, angelfish, manta rays, loggerhead turtles and, in the summer, breathtaking whale sharks. Best of all, this beyond-your-wildest-imagination wonderland is only 100 miles off the Texas coast. 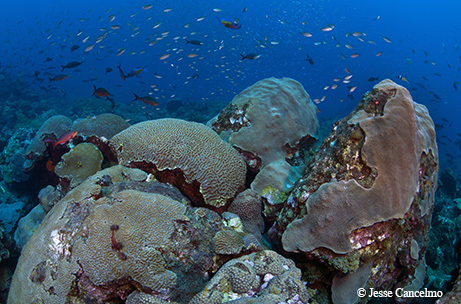 After 30 years of scientific study, the National Oceanic and Atmospheric Administration is proposing to expand the Flower Garden Banks National Marine Sanctuary to protect additional critical Gulf of Mexico habitat. The NOAA plan lays out five expansion scenarios, ranging from no expansion of the 56-square-mile sanctuary to one plan expanding protection to a total of 935 square miles. In NOAA’s preferred scenario, the sanctuary would expand to 383 square miles to include 15 reefs and banks that provide habitat for recreationally and commercially important fish, as well as a home to 15 threatened or endangered species of whales, sea turtles and corals. The public is invited to comment on this proposal until Aug. 19. Public meetings were held in Texas, Louisiana and Alabama in July. Comments collected during this process will be used to develop a final environmental impact statement. For more details about the expansion, or to download the draft environmental impact statement, please visit flowergarden.noaa.gov. Robert Earl Keen will headline the 6th Annual Texas State Bison Music Festival on Sept. 17. The all-day event features some of Texas’ greatest Americana and Texas country music artists, arts and craft vendors, food and fun for all ages. Proceeds from BisonFest will help restore the Texas State Bison Herd to its historic range at Caprock Canyons State Park, where visitors can celebrate the cultural and natural history of the Panhandle. In 1878, famed cattleman Charles Goodnight and his wife, Mary Ann, brought the descendants of this Texas herd back from the brink of extinction. Goodnight captured wild bison in the canyons surrounding the Caprock Escarpment during the height of the infamous bison slaughter. (At one time, there were 30 million to 60 million bison roaming North America, but by 1895, there were a mere 541 animals remaining.) Caprock Canyons State Park has developed an aggressive management plan to restore the park landscape and wildlife to their natural state.